I am very proud to present my first Granny Square. Having never picked up a Crochet Hook before I am very pleased with the results, I have to thank Jane for her patience in teaching me this new found skill and I have to tell you it really isn't as tricky as you might think. This took me about 2 hours to create but to say I have the bug would be an understatement, I have visions of having to offer my creations to friends and family as my excitement may result in the generation of more crocheted blankets than one house should really hold. I think I will stop short of producing a dress though, whilst this creation doesn’t look bad on the stunning Cate Blanchett I don’t imagine that anyone over a size 8 would be able to pull of such an outfit, and poor ol’ Cate has come under heavy criticism for this ensemble by Sydney design duo Romance Was Born. Certainly a bold move and has gathered here a few media inches. You never know though this may be bang on trend for A/W 2010/2011, I’d better start the diet and the Granny Square production line now so I can be dressed in a blanket like all the other fashionistas out there should the trend arise. 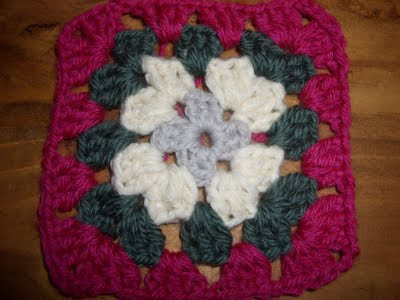 This brings back many memories of crocheting squares for a blanket which I never finished. You have inspired me to search for the unfinished work. You were curious about working with threads from a very young age and perhaps the initial interest and your capability come from both sides of your family. Your grandma on Dads' side did intricate tatting which is fine crochet work and looks like lace. She also produced many pictures using cross stitch. You also produced pictures this way several years ago. Your greatgrandma on my side of the family was always crocheting edges for tablecloths, traycloths, pillowcases, sheets and runners for tables and sideboards. She attached them to beautiful white linen, several of which I have today. Unfortunately, although they wash easily, they need to be starched in order to achieve a perfect smooth finish. I have also always been interested in different types of crafts using threads of various forms and colours.